Design of a seismic resistance RCC structure is primarily based on maximizing energy absorption capacity of various structural elements. Adequate ductility is crucial to avoid inelastic deformation or brittle failure and increase potential of the energy dissipation. Since, the ductile strength in a reinforced structure is largely dependent on steel TMT bars, the elementary qualities like the manufacturing process, chemical composition and the mechanical properties are important factors in determining the quality of TMT bar. The yield strength in good quality TMT bar , such as TopTech, far exceeds the standard norms and specifications. The UTS/YS ratio and percentage elongation that determine the seismic property of a rebar, is also high in these TMT bars. This significantly enhances its ability to handle the pressure of earthquakes and other external forces. The advanced manufacturing process of TopTech steel TMT bar makes it well surpass the minimum limit of ductility and strength specified in the standard IS: 1786. Earthquake resistant RCC structures go through huge inelastic deformations for enough seismic energy dissipation. 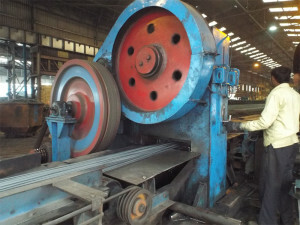 Because the reinforcement bar controls the post-yield RCC structure, Yield Strength (YS), Ultimate Tensile Strength (UTS) and both their ratio (UTS/YS) as well as the elongation are a few essential areas of the steel rebar manufacturing.Â The UTS and YS values must be in proper balance with the specified values; otherwise it may cause brittle failure instead of enhancing the ductile strength. Higher UTS/YS ratio is also necessary to increase the dependable strength that is greater than the YS. UTS/YS ratio is imperative because the maximum strength capacity of the structure must be distinguished from the YS, as it helps in measuring the distribution of inelastic activities and failure mechanism across the RCC structure. Maximum elongation value specified by most of the international standards is easily met by the steel rebar processed through proper Thermo-mechanical Treatment. Thus it is important to choose good quality steel rebar like the TopTech TMT bar, that is based on the latest Tempcore manufacturing process, infused with balanced mechanical properties in sync with specified standards.